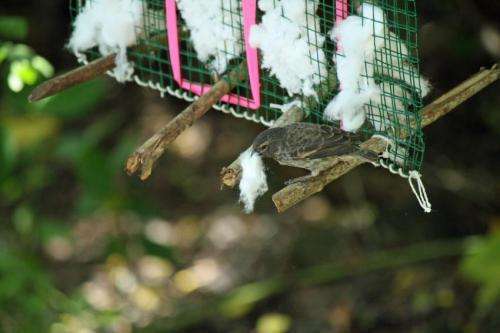 When University of Utah biologists set out cotton balls treated with a mild pesticide, wild finches in the Galapagos Islands used the cotton to help build their nests, killing parasitic fly maggots to protect baby birds. The researchers say the self-fumigation method may help endangered birds and even some mammals. "We are trying to help birds help themselves," says biology professor Dale Clayton, senior author of a study outlining the new technique. The findings were published online May 5, 2014, in the journal Current Biology. "Self-fumigation is important because there currently are no other methods to control this parasite," blood-sucking maggots of the nest fly Philornis downsi, says University of Utah biology doctoral student Sarah Knutie, the study's first author. Clayton says the parasitic nest fly may have invaded Ecuador's Galapagos Islands via ships and boats from the mainland at an unknown time and "showed up in large numbers in the 1990s. So the birds have no history with these flies, which is why they are sitting ducks. From the perspective of the birds, these things are from Mars." Knutie says the flies now infest all land birds there, including most of the 14 species of Darwin's finches, two of which are endangered: fewer than 100 mangrove finches remain on Isabela Island, and only about 1,620 medium tree finches exist, all on Floreana Island. 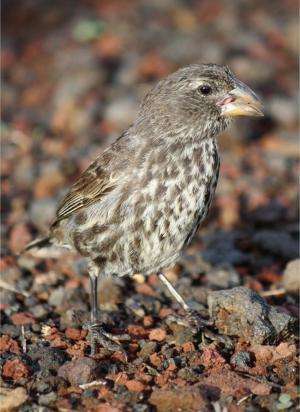 Nest flies have been implicated in population declines of Darwin's finches, including the two endangered species. Clayton says the pesticide – permethrin – is safe for the birds: "It might kill a few other insects in the nest. This is the same stuff in head-lice shampoo you put on your kid. Permethrin is safe. No toxicologist is going to argue with that. The more interesting question is whether the flies will evolve resistance, as human head lice have done." Clayton believes that will not happen if treated cotton is placed only in the habitats of endangered finches, not others. Knutie and Clayton conducted the study with University of Utah doctoral students Sabrina McNew and Andrew Bartlow, and with Daniela Vargas, now of the Autonomous University of Barcelona in Spain. The study was funded by the National Science Foundation, the University of Utah and a crowd-funding campaign. Can Other Species Fumigate Themselves? Knutie and Clayton say their method might help the endangered mangrove finches, with only 60 cotton dispensers needed to cover the less than half a square mile inhabited by the birds on Isabela Island. So scientists there recently started a preliminary experiment to determine if mangrove finches will collect cotton balls from dispensers. "There are other species of birds that are hurt by parasites, and so if the birds can be encouraged to incorporate fumigated cotton into their nests, then they may be able to lessen the effects of the parasites," Knutie says. Examples: Hawaiian honeycreepers infested with feather lice, birds in Puerto Rico afflicted by Philornis flies and the endangered Florida scrub jay parasitized by fleas. The same method might be used for the black-tailed prairie dog – removed from the endangered species list but still declining on the Great Plains and often infected by fleas with plague bacteria, Knutie says. Permethrin has been sprayed in burrows, but that is labor-intensive, so it might be used on vegetation the animals drag into their burrows. Knutie says permethrin-treated cotton has been used in the Northeast to get mice to incorporate it in their nests to kill Lyme disease-carrying ticks. Results weren't clear. The new study was done in the Galapagos Islands, where the diversity of finches helped inspire Charles Darwin's theory of evolution after he visited in the 1830s. Knutie got the idea for the new study four years ago at her dorm in the Galapagos when she noticed Darwin's finches "were coming to my laundry line, grabbing frayed fibers from the line and taking it away, presumably back to their nests," she recalls. The birds also collect toilet paper, string and fibers from towels. Parasitic nest flies lay their eggs in finch nests, which have dome-shaped roofs of woven plant fibers. When the eggs hatch, they become larva or maggots, which feed on the blood of nestlings and on mother finches brooding their eggs and nestlings. Past studies found that in some years, maggots kill all the nestlings in nests they parasitize, but spraying nests with 1 percent permethrin solution eradicates the maggots. So Knutie wondered if finches could be encouraged to pick up treated cotton to fumigate their own nests, located in tree cacti and acacia trees. She ran her study during January-April 2013 at a site named El Garrapatero on the Galapagos' Santa Cruz Island. The biologists built wire-mesh dispensers for the cotton. They tried processed cotton balls treated with 1 percent permethrin solution and, as a control, unprocessed cotton balls treated with water. Processed and unprocessed cotton balls appear slightly different, so researchers could distinguish treated or untreated cotton in nests. In a preliminary experiment, Knutie showed the birds had no preference for collecting treated versus untreated cotton, or for processed or unprocessed cotton. In another preliminary test, the researchers showed that the finches, which are territorial, travel no more than 55 feet from their nests to collect nest-building material. During the key experiment, Knutie and colleagues set up two lines of 15 cotton dispensers – one line on each side of a road in arid scrub woodland. In each line, dispensers alternated between treated and untreated cotton, and dispensers were 130 feet apart – more than twice 55 feet, making it likely each nesting finch had a favorite dispenser. That was confirmed: none of the nests were found to have both types of cotton. The researchers searched for active finch nests weekly within 65 feet of each dispenser, using a camera on a pole to check each nest and confirm breeding activity. They found cotton balls were collected by at least four species of Darwin's finches: the medium ground finch (Geospiza fortis), small ground finch (Geospiza fuliginosa), small tree finch (Camarhynchus parvulus) and vegetarian finch (Platyspiza crassirostris). In some cases, researchers were unsure which species occupied a nest. After birds in a given nest finished breeding (within three weeks) and left the nest, the scientists collected the nest, dissected it, counted the number of parasitic fly maggots and then weighed and separated all the nest materials, including cotton. The Utah biologists found 26 active nests, of which 22 (85 percent) contained cotton: 13 nests had permethrin-treated cotton, nine had untreated cotton and four had no cotton. Regardless of treatment, the amount of cotton in nests and the percent of the nest made of cotton didn't vary significantly. 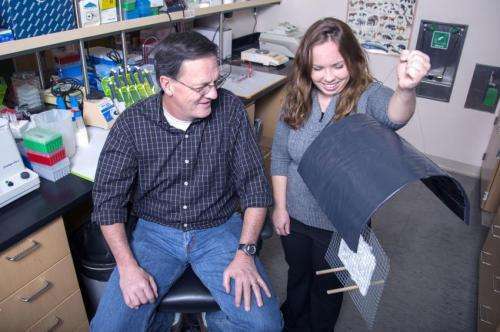 The researchers write that their study found "self-fumigation had a significant negative effect on parasites," killing at least half the fly maggots. The 13 nests with treated cotton averaged 15 maggots, give or take 10. Nests with untreated cotton averaged 30 maggots, give or take eight. The amount of untreated cotton in a nest was unrelated to the number of maggots; but the more treated cotton, the fewer the parasites. 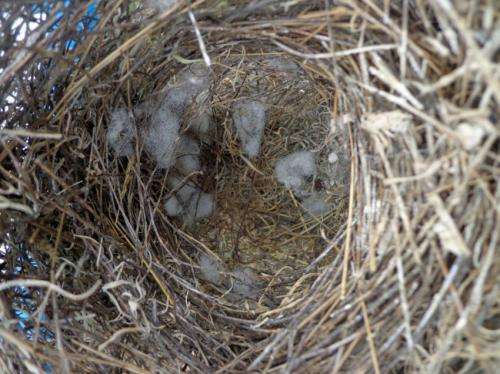 Of eight nests with at least 1 gram of cotton (one 28th of an ounce), seven had no maggots and one nest had four. "If the birds insert a gram or more of treated cotton – about a thimbleful – it kills 100 percent of the fly larvae," Clayton says. A separate follow-up experiment – and earlier studies by others – showed killing the parasites with sprayed permethrin increases baby bird survival. The researchers did not study survival of offspring in nests with cotton balls because that requires repeatedly climbing to nests so birds can be weighed and banded, which might disrupt the birds from self-fumigating their nests with cotton balls.